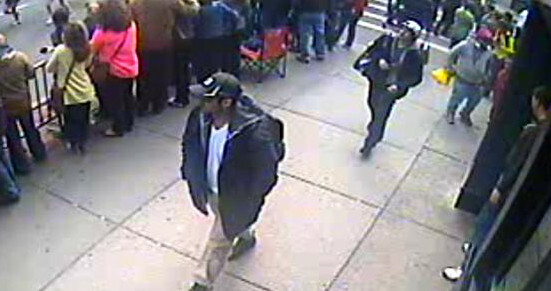 The Marathon Bombings, Privacy and the Question "Why?" - This Can't Be Happening! It’s tough to think clearly when death and destruction hog our minds and when an attack seems so senseless. It’s as if logic abandons us and even the attempts by our groping commercial media to attribute these actions to some logical thinking will fail. In the end, we’ll probably find that Dzhokhar and Tamerlan Tsarnaev were no more logical in their vision and intent than Adam Lanza, the Sandy Hook killer, or Wade Michael Page, the white supremacist who killed six Sikhs at a Wisconsin temple last year. Yeah, there’s always a “reason” but the reason never really tells us “why”. That unanswerable “why” on our lips and in our minds unifies us with the world. It’s the very same “why” people ask when a drone plane destroys their homes or when soldiers with guns like the ones carried on Boston’s streets come into their houses, scream at them in a language they don’t understand, violate their culture and then, in some cases, take them away or kill them on the spot. In Iraq, there are an estimated 120,000 “why’s” that have been screamed and there is no reasonable answer to any of them. What do we tell them? That our government killed their relatives and neighbors and friends because their President, whom they probably hated, had weapons he didn’t really have? How “logical” is that response? Maybe what we need is a world-wide movement asking the question “why?” Maybe one is already forming. Maybe that’s why our government responded as it did last week. As my colleague Dave Lindorff points out, what lingers is that government officials set a precedent by closing a major American city. Boston, as a living center and municipality, was de-activated and this was accompanied by what can only be described as a military mobilization. People cooperated with this seige probably partly out of a sense of duty and partly out of fear. But the people who declared the lock-down didn’t know that would be the response and, based on how they acted, they didn’t care. We can all question whether this show of force was actually necessary or even effective — my answer is “no” to both (and it’s instructive that the fleeing suspect was located by a citizen only after the lock-down was lifted) — but it might be more important to pose our own “why?”. The speed of launch of this coordinated action ordering a million people to stay in their homes means that the plan and personnel were almost certainly already organized and in place. This was a test. And the government now knows it can quickly launch a shut-down and military occupation of a major city without being asked “embarassing questions”: Who ordered it? Based on which laws? Was there any discussion about its implementation with someone representing the people of Boston? What are the criteria for completely suspending all our rights? In the future, as Dave points out, the government will certainly use this tactic again and will probably cite “public safety” as the reason. But when is public safety threatened and who decides that? Is “public safety” threatened by, for example, a general strike or a huge demonstration? As far-fetched as that might seem even today, it’s important to remember that public safety was also the reason cited for the simultaneous national actions dismantling the Occupied movement — a demonstrably and avowedly peaceful protest that posed no threat to anyone. The history of this country is littered with “expanded use” of repressive tactics. They do it once in a situation people can tolerate or even support and then they start doing it for all kinds of broader reasons, including quashing protest and opposition movements. This was the hallmark of the Bush Administration and the Obama Administration is, if anything, even more aggressively repressive than its predecessor. That’s the context in which we have to view the issue of “privacy”. Debates are often won in the initial phase when we frame what we’re debating and the enemies of constitutionally protected privacy have initially prevailed. They’ve managed to frame the discussion in such a highly individualized and limited way that arguing against the invasion of privacy can now seem frivolous. So the fact that everyone attending the Boston Marathon probably appears on some video or in some photo is viewed by many as a comforting indication that crime can no longer go un-recorded. Nobody would argue that the government shouldn’t ask people’s cooperation in solving a crime, particularly one as hideous as this one. The problem is what “crime” will the government seek information about in the future? If it sticks to catching guys who want to blow people up, we’re okay. But this is a government that has jailed activists, broken into people’s homes, seized computers (including a server belonging to our web hosting service May First/People Link), intercepted email and bullied people into giving up their rights or, failing that, merely stepped all over their rights. We have scores of active cases that wreak of this repressive stench. In fact, the prosecutor in this Marathon case, U.S. Attorney Carmen Ortiz, is the person who was mercilessly bullying Aaron Swartz when he committed suicide. The hallmark of a police state is convincing citizens to inform on each other. That nightmare situation, reminiscent of East Germany, China and other totalitarian states, is also now in place. So is the network of Close Circuit cameras that take pictures of our lives in many of our major cities nationwide and will soon be part of the landscape of every major living area in this country. There are millions of them; some estimates say 30 million cameras have been installed by governments, stores, offices and gathering places nationwide. We can’t really be sure but we know that, in New York City’s Lower East Side alone, there are already 3,000 surveillance cameras. We are now being watched and, when it deems appropriate, the government will enhance that surveillance because it now has the technology to do it in a highly efficient and stealthy way. Defenders of this insane intrusion argue that most of that tape will never be used against law-abiding people. In fact, they say, most of it won’t ever be seen. It will be “filed away”. After hearing that in countless television interviews this week, I am not feeling a whole lot better. The problem isn’t when they watch you, it’s that you don’t know when they’re doing it and you have no idea what they are doing with that “filed away” surveillance footage. The political centerpiece of a police state isn’t that the government is always repressing you, it’s that the government is free to decide when it will. When the government does decide to take a look at you on camera, it will go to those files at that huge Utah complex the Obama Administration is opening in the Fall to keep a record of virtually every recordable aspect of everyone’s life — Internet activity (including social network and email exchanges), satellite photos of living and work areas, law enforcement reports on actions and activities we may participate in, birth and other personal data records…everything that can be recorded about you. It’s not gathering that data just to archive it; there is already software in place that can map a location, sort all pictures and videos of it and track people who were there at any time. That’s probably how they tracked the Tsarnaev brothers. They can match the photo of anyone at any location with all kinds of other photos on-line or in government documents. They can identify you in a very short time. Computers and the powerful databases they can run make all this possible and software is always being developed to enhance this kind of matching and sorting. In this frightening effort, the Obama Administration has the cooperation of the Congress. This week, as authorities were tracking the suspect brothers, the House of Representatives passed a truly remarkable law called The Cyber Intelligence Sharing and Protection Act (CISPA). Essentially, this law allows any private company to share information about you and your activities with the government. While it doesn’t make such sharing mandatory, you have to be born on another planet to believe the government won’t use it to pressure companies to give you up. Anyway, major corporations like Google have already supported most of its provisions. It’s obvious how your email can be a quick and easy surveillance tool but because the Internet assigns you an IP (Internet Protocol) address whenever you log on, you can also be tracked wherever you go on-line — websites, social media…everywhere. Up to now, most providers have refused to give up that information citing “agreements” they have with customers based on privacy. But this law allows them to violate those agreements and, as is the case with registered Google users, the privacy agreement will lose its relevance and soon become a relic for most providers. “CISPA would effectively take the door off the hinge of every household in America,” says technology-freedom Pac textPac, “but (it) lacks the tools necessary to distinguish whether there is a criminal hiding in the attic. Why surrender the core of our privacy for the sake of corporate and governmental convenience?” Why indeed? Because, according to the Obama Administration, you don’t have the right to privacy. As has been said in these webpages before, you have a right to privacy in your home to cook what you want, say what you want and do whatever else you want to do. That’s part of the understood guarantee of privacy. But that is not, and never has been, the essential thrust of the privacy concept in our laws. Indeed, privacy is the basis of our laws protecting women’s choice, shielding us against illegal searches and seizures, upholding our right to relationships with others and a variety of other legal rights. That’s because the constitutional definition of privacy doesn’t mean somone shouldn’t peek behind a curtain, it means protection from the government watching and investigating you. It is a preventive device against government intrusion into a citizen’s activities and life. It is an essential component of freedom and democracy. Privacy is the right, understood to be implicit though never specifically stated in the constitution but supported by a long list of courts and law-makers, to make sure our government doesn’t record conversations you may have with others or take pictures of your attendance at meetings or demonstrations. Under this concept of privacy, you can say what you want to anyone and hear what they say, meet and consort with anyone, and organize and encourage anyone to do anything. As long as what you are doing isn’t illegal, the government has no business listening, watching or recording any of it. These are protected activities and none of the government’s business. If that sounds ridiculous, or not feasible, it’s because our privacy has been progressively eaten up by decades of legislation, police procedures, and court rulings enhancing the government’s ability to “fight crime” by obliterating specific privacy rights we have. Police can stop and search you based on “probable cause” they can invent on the fly. The FBI can seize anything it wants including computers, papers and videos in your home based on the possibility this material may be connected to a crime. As recent cases demonstrate, the government can examine the content of your email, your visits to particular websites or your transfer of digital data by expressing a suspicion, no matter how far-fetched, that these may somehow be linked to a crime or provide information about one. The lesson of Boston and last week is that, in the Obama Age, you have no privacy left. My mother, fretting about noisy neighbors’ parties in the South Bronx of my youth, frequently repeated an old Puerto Rican saying: “No se puede bajar el ruido después de la fiesta.” (“You can’t lower the noise after the party’s over.”) Talking about this privacy issue feels just like that. It feels almost senseless to argue about the importance of privacy when it has already, effectively, been taken from us and when its true meaning has been so distorted in the public debate that raising it often provokes puzzled expressions and shrugs of helplessness. It’s especially difficult when the government hides behind monstrous crimes like the Marathon bombings or dangerous intrusions like cyber-theft. It feels like the debate is over. But a movement that opposes government oppression would do well to make privacy one of its prongs. They are gathering our information, true enough, but we can still challenge them on how they use it. We can fight them on introducing it into cases. We can oppose their attempts to get large communities to “rat” on demonstrations or political active individuals. We can expose their jaded definition of privacy and force the debate to focus on its real purpose and theirs. We can ask them the question: Why? And organize around their answer.